The New England Patriots captured their sixth championship on Sunday, defeating the Los Angeles Rams 13-3 in Super Bowl LIII. "You know, it was an unbelievable year," Tom Brady, New England's quarterback, said after the game. "We just fought through ... this is a dream come true for all of us." 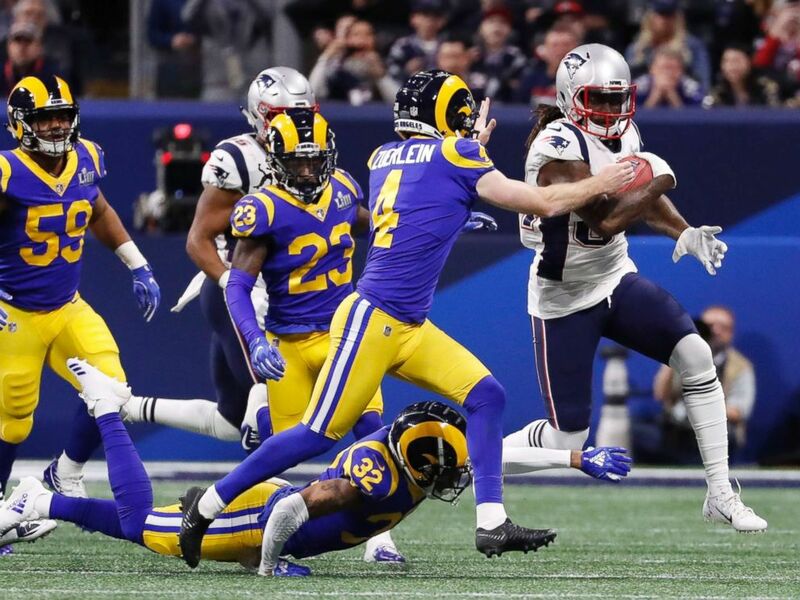 Brady said "the Rams played their butts off" but that New England's defense played its best game all year, with the Rams becoming only the second team in Super Bowl history not to score a touchdown. The final score is the lowest in Super Bowl history. "It's unbelievable," Brady added, "to win this game." Los Angeles Rams wide receiver Josh Reynolds (83) and New England Patriots cornerback Jason McCourty (30) battle for a pass during the second quarter of Super Bowl LIII at Mercedes-Benz Stadium, Feb 3, 2019, Atlanta. The game appeared to swing the Patriots' way after a touchdown by running back Sony Michel late in the fourth quarter gave New England a 10-3 lead. 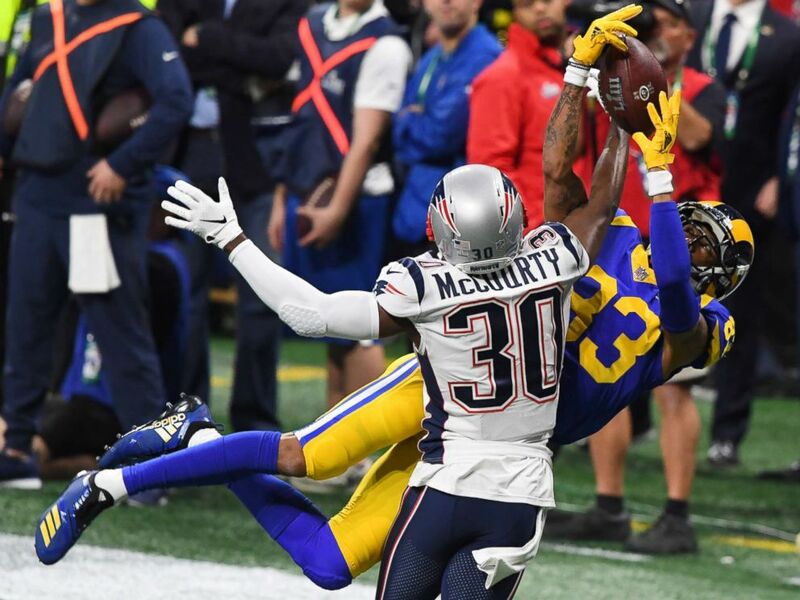 Los Angeles tried to answer, but a Jared Goff interception inside the Patriots' 5-yard line with only a couple minutes remaining killed the Rams' drive. The Patriots, off the turnover, drove down and added a field goal with 1:12 left to take a commanding 13-3 lead. The Rams, trying to make it a one-score game, missed a 48-yard field goal with eight seconds left. New England Patriots' Cordarrelle Patterson in action with Los Angeles Rams' Greg Zuerlein, Feb. 3, 2019. New England wide receiver Julian Edelman, with 10 receptions for 141 yards, was named the game's Most Valuable Player. "It just matters that we won. It was a crazy year," said Edelman, when asked about winning the award. Donnie Donahue of Milford, Massachusetts, a Patriots' season ticket holder for 26 years, told ABC News the victory was "awesome." "It's unbelievable," Donahue said. "Number six? Can you believe it?" The Pittsburgh Steelers are the only other team with six Super Bowl wins. At halftime, the teams went to the locker room with the Patriots leading 3-0, but Rams fans were still optimistic. 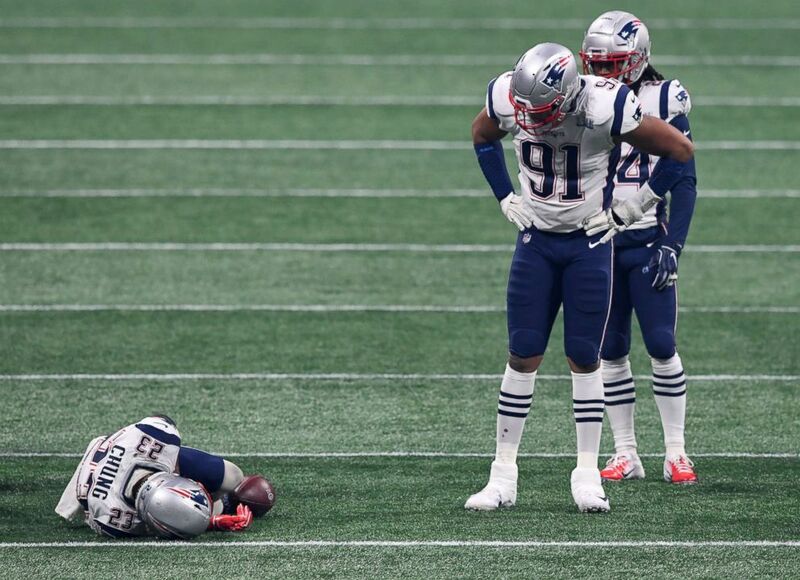 New England Patriots players look on as strong safety Patrick Chung (23) lays on the field after suffering an apparent injury during the third quarter of Super Bowl LIII against the Los Angeles Rams, Feb 3, 2019, in Atlanta. "The defense is playing darn good!" said Rams fan Doug Trebtoske, whose face was painted blue and gold. "And the second half here is going to open it up." "The defensive battle is insane," said Sean Bellott, who'd traveled from Auburn, New York, to attend the game. "So far I'm enjoying it," he added. 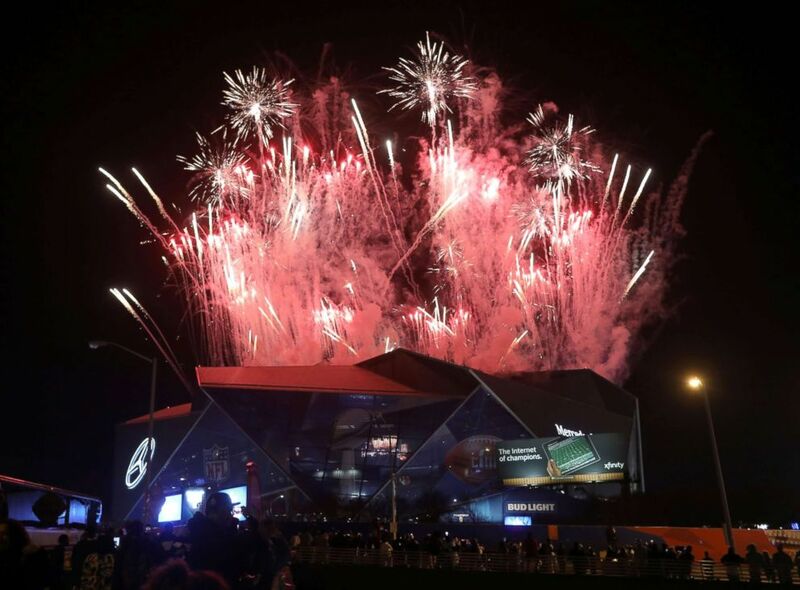 Fireworks erupt during the NFL's Super Bowl LIII Halftime Show at Mercedes-Benz Stadium in Atlanta, Feb. 3, 2019. Patriots fan Christine Carrano, from Milford, Massachusetts, said she was hopeful her team could keep its lead. "I think the game is awesome," she said. "We knew it was going to be tough but still believe in the Patriots." 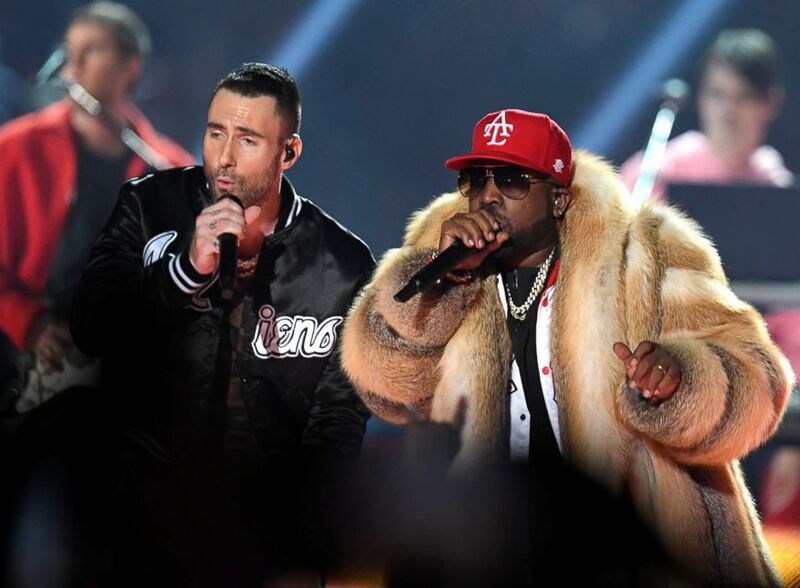 Adam Levine of Maroon 5 and Big Boi perform during the Pepsi Super Bowl LIII Halftime Show at Mercedes-Benz Stadium, Feb. 3, 2019, in Atlanta.